Forbes Magazine picked in 2013 ten European alternative lending platforms to watch. The industry was worth 1.21 billion euros that year, and it more than doubled last year to 2.95 billion, becoming ever more diverse and fragmented as new platforms came to market. 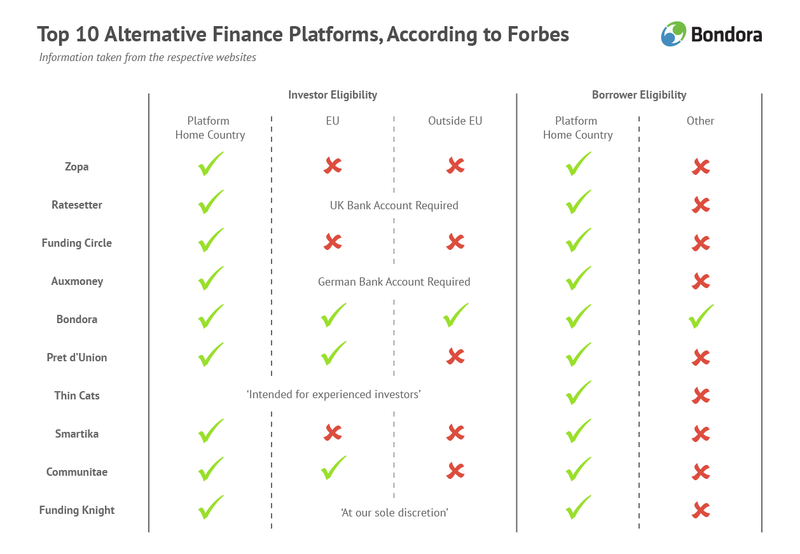 In the UK alone today there are over 100 platforms available for alternative business lending, making for a confusing choice for both investors and borrowers. But what happened to Forbes’ rising stars of 2013? How are they faring now, and will they continue to stand head and shoulders above an ever more competitive market? Alternative finance platforms that are built to retain competitive advantage have to have the ability to scale cross border, otherwise they will soon find themselves trapped in a market that is rapidly filling, with a ceiling on their growth rate. Only 10% of European platforms receive between 11-30% of investment from elsewhere in Europe and the world, offering diversification and growth potential in a market that is developing at an uneven rate across Europe. So how do Forbes’ ‘Class of 2013’ fare in this respect? According to recent research from Ernst & Young/University of Cambridge, 50% of alternative finance platforms in Europe reported no inflow of investment from countries other than their home base. The UK based lenders are among this group, with Zopa, in common with Funding Circle allowing only UK residents to invest. In continental Europe, platforms take varying approaches to investor location – Pret D’Union, for example, requires private investors to be aged over 18, and hold a bank account within the EU, but does not place restrictions on residency. But even newer platforms do not necessarily open up the opportunity for investors on a global scale. Bondora is structured differently. With recent Series A funding to the value of $5M, Bondora is now an established force in European alternative finance, having served over 183,000 customers, and originated 127 million euros in loans since being established in 2009. Investing with Bondora is open to anyone over the age of 18 living in the European Union or Switzerland, as well as businesses registered in the EU. Additionally, accredited investors from Australia, Brazil, Canada, Hong Kong, India, Japan, South Korea, Mexico, Singapore, Switzerland, South Africa or The United States of America are eligible upon completion of checks. According to Altfi.com data, at the time of writing (September 2015), Bondora is the third largest Peer lender by volume in continental Europe, with around 7.5% market share. By offering the opportunity to invest to a global audience, Bondora has the opportunity to attract private and institutional investors almost regardless of their location, effectively removing barriers to growth imposed by national borders. Scalability and global reach is also determined by the geographic scope in which a platform can lend. In 2014, 72% of European alternative finance platforms reported no outflow of loan funding beyond their country borders at all. However, 5% of European platforms bucked the trend and reported 91-100% of their outflow going to multiple countries beyond their immediate base. As the market matures, this 5% will surely be joined by others. In June 2015, the European Parliament called for more cross border altfi investment to support SMEs in particular. Bondora was the first European peer lender to offer cross border lending, with loans now issued in Spain, Finland and Estonia, and of the ten platforms picked out in 2013 by Forbes, is alone in lending in more than one geographic location. While other platforms have bought into new markets, we have focused on building an internal framework that allows us to work cross borders. Europe still struggles under massive divisions in terms of access to capital, caused by local regulatory and economic realities. With the emergence of the alternative finance market comes the opportunity to smooth out some of the disparities in this market, if platforms are able to disrupt the traditional financial services sector and build a marketplace unbounded by geographical borders. Among the platforms picked out in 2013 by Forbes, Bondora is well placed to scale up through focusing on cross border investment and lending. With a European alternative finance market looking to hit 5 billion euros this year, the growth opportunity for ambitious, globally minded platforms such as Bondora, is unprecedented.